The relation between test length and measurement precision is optimized. The AMT requires fewer items than most non-verbal intelligence tests for more accurate calculations. 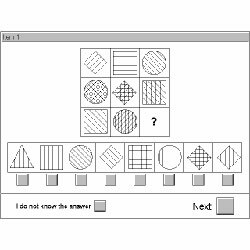 This test is a non-verbal assessment of the general intelligence based on eductive thinking, and is thus mainly independent of cultural and social backgrounds; it can be applied to persons aged 15 years and over. Main areas of application: performance-oriented aptitude diagnostics, consulting regarding school, college, and career decisions, traffic psychology, industrial, and organizational psychology, aviation psychology, sports psychology. The items resemble classical matrices, but they are based on explicit construction rules. Altogether, almost 300 items were created on the basis of these rules and they were evaluated with a large sample of people in an extensive study in Aachen (Germany), Katowice (Poland), Moscow (Russia), and Vienna (Austria). Probabilistic characteristic values were estimated for the items. The resulting item pool now allows for an adaptive test presentation with all advantages of modern computerized diagnostics: shorter administration time but improved measurement precision, and highly motivated respondents due to a selection of tasks that are adequate for each individual person taking this test. The entry of answers is adaptive. It is not possible to omit an item or to return to the last one. The 9 answer options are designed to reduce guesses. The person's parameter of the variable "General Intelligence" is calculated as the test value. Because of the validity of the Rasch model, reliability in the sense of internal consistency is given. For the four test forms it has been set at a standard measurement error (SEM) of 0.63, 0.44, 0.39 and 0.63, corresponding to reliabilities of 0.70, 0.83, 0.86 and 0.70. This reliability applies to all respondents and at all scale levels. This is the central and significant advantage over other widely-used psychometric tests based on classical test theory: all respondents are assessed with equal reliability. According to Hornke, Etzel & Küppers (2000; Hornke, 2002), the construction rational correlates at 0.72 with the difficulty parameters. In addition, Sommer und Arendasy (2005; Sommer, Arendasy & Häusler, 2005) demonstrating using a confirmatory factor analysis that this test, together with tests of inductive and deductive thinking, loads onto the factor of fluid intelligence (Gf). Fluid intelligence was found to be the intelligence factor with the highest g-loading. A number of studies carried out in the fields of traffic and aviation psychology also confirm the test's criterion validity. Norm data is available for an evaluation sample of N=1356 respondents and for a norm sample of N=461 respondents. Between 20 and 60 minutes (including instruction and practice phase), depending on test form. This test is a non-verbal assessment of the general intelligence based on eductive thinking, and is thus mainly independent of cultural and social backgrounds.